This is probably one of the coolest and most impressive bedroom designs ever! I’m not nuts about the orange paint job in this room (because you know pink is my color), and the ‘fondant-like,’ colorless linens should be illegal – but I sure do love the idea of sleeping on a bed that’s suspended over a small body of water. Sleeping is one of my favorite activities and I am sure that being cradled in such a nocturnal environment as this would inspire me to have very comforting dreams. 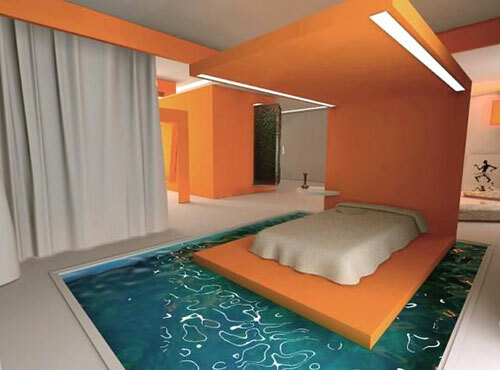 Water beds have never really been my thing, but this I like! Sleep-walking or just rolling out of bed may prove interesting. I love this kinda stuff !!! Eclectic furniture & furnishings have always been a passion of mine. Thank you for this for sure, GREAT IDEA !! !